An injury of any form at all is a menace to every professional athlete and like the plague, it is something they all want to avoid as much as possible but like retirement, having an injury is simply inevitable. The best that athletes can do is hope that the rate at which their injuries occur is as low as possible and even when they do get hit by one, a minor one that would require a few weeks for full recovery. But Sadly, this isn’t always the case for some as a number of the world’s great athletes have been faced with the hard decision of kissing their careers goodbye as a result of an injury. One such great athlete is American football tight end, Zach Miller. However, through the pain, Miller has received much support from his family especially his wife and the love of his life Kristen. Here goes his story. Born on October 4, 1984, in Weston, Nebraska, Zach Miller began playing football during his years at Bishop Neumann High School in Wahoo, Nebraska. A highly energetic young man, he played in two other sports including basketball for which he received all-state honors. He did better at football so when he chose to attend the University of Nebraska Omaha, his focus was on football. In college, Zach was simply outstanding. He finished with a school record 50 touchdowns. A pro career looked certain and it began after the Jacksonville Jaguars selected him in the 6th round of the 2009 NFL Draft. And then came September 2012 when Zach Miller’s injury troubles began. He was placed on the injury reserves before getting waived a month later. Tampa Bay Buccaneers came for him in the new year but Miller couldn’t prove worthy of a berth on the team so he was dropped. The Chicago Bears became his white knight signing him to a future/reserve contract on December 30, 2013. He inked another contract on February 27, 2015, and on March 14, 2016, a two-year contract worth $5.5 million. Miller looked poised to go on and write his name in the NFL history books but little injuries continued to limit him. 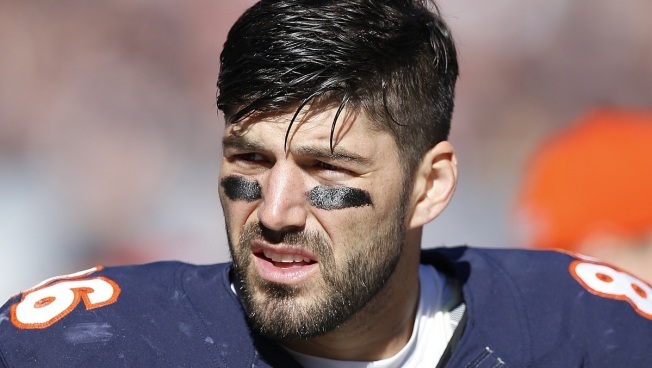 Zach Miller’s life flashed before him when he suffered a life-threatening career-wrecking injury on October 29, 2017, during a week 8 game against the New Orleans Saints. He had been attempting to catch a touchdown pass when he fell wrongly dislocating his left knee and tearing his popliteal artery. He was immediately rushed to the OR where he received a vascular surgery that required grafting from his right knee. Fortunately, the surgery was successful and did not require an amputation like is always the case with similar injuries. He reportedly had 8 surgeries on his knee by December 2017. The Bears placed him on injured reserve in November 2017 after which he became a free agent. However, the Bears were not about to abandon him as they signed him to a one-year deal on June 4, 2018, with $458,000 guaranteed even with the knowledge that he may never get to play football again. A day later, he has placed on the reserve/PUP list. Miller’s football future looks bleak but like he has told reporters since the gruesome injury, he would rather focus on the present than worry about the future. Zach Miller has a degree in criminal justice. Throughout the storms has been one woman not leaving his side. She is his wife Kristen Miller (nee Pospisal). The pair were high school sweethearts during their time at Bishop Neumann High where Kristen played in the volleyball team. Kristen attended the same college with her future husband. She graduated with a bachelor’s degree in business administration and minored in finance. As seen on Wahoo Newspaper, Zach and Kristen got married on July 26, 2008, at St. Wenceslaus Catholic Church in Wahoo, Nebraska. Zach and his wife Kristen have built such an adorable family together. They share three kids together including daughter Isabella born in 2010 and sons Kashton and Breckin born in 2012 and 2017 respectively. From his interviews since the injury, it is quite obvious that Miller is a family man. He has told several publications including The Lincoln Journal Star, how his wife Kristen have helped make his rehab a smooth one. Zach Miller has a complete athletic body build. According to his player profile on the ESPN website, Zach Miller stands at 6 feet 5 inches tall. Pre-draft, he stood at one inch shorter at 6 feet 4 inches (1.93 m). His weight is recorded at 245 lb (111 kg), 5 lb up from before he made his NFL debut. Other details of his body measurements are yet to be confirmed.